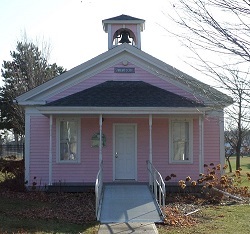 The restored 1854 Pink School stands on park land on West Ash Street in Mason. The Pink School was moved to the West Ash location in 1976 from the northeast corner of College and Columbia (Google Map https://goo.gl/maps/v3J79VCM3Dp) when the road commission requested land. It was then turned over to the Mason Area Historical Society. There are several stories explaining the school's pink color. One story has it that insufficient red paint was donated, so some white paint was added, making the color pink. Because of its unusual color and notoriety, it was decided to keep it painted pink. 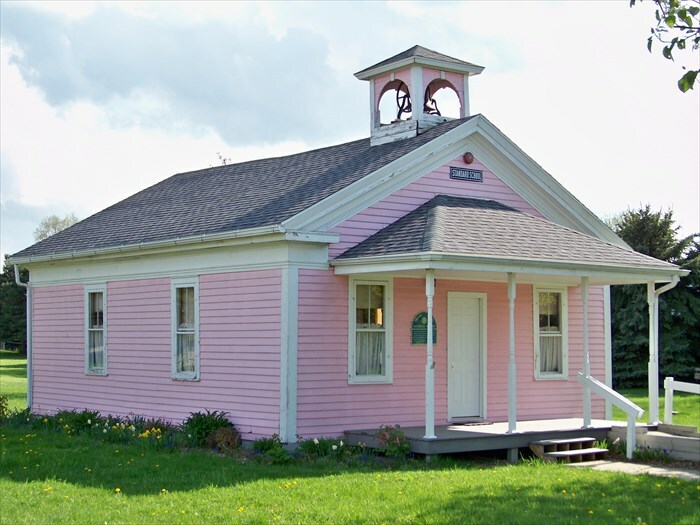 The restored 1854 Pink School building now stands on Mason parkland on W. Ash St. In April, 1976, it was moved there from its former site at the northeast corner of College and Columbia Roads. It became the project of the Bicentennial Commission to save it from destruction as the road commission requested land to straighten the bend in Columbia Rd. Then it was turned over to the Mason Area Historical Society. The schoolhouse was built by William F. Near for $299.95 in 1854, on less than an acre of land which was donated by Hiram Bristol, from what is now the Hall farm. It was heated by wood at 44 cents a cord. The building was 24 by 30 feet which included a narrow cloak hall across the front with a shelf for dinner pails at one end, and a bench for a water pail with a dipper. Each pupil had his own cup in his desk. 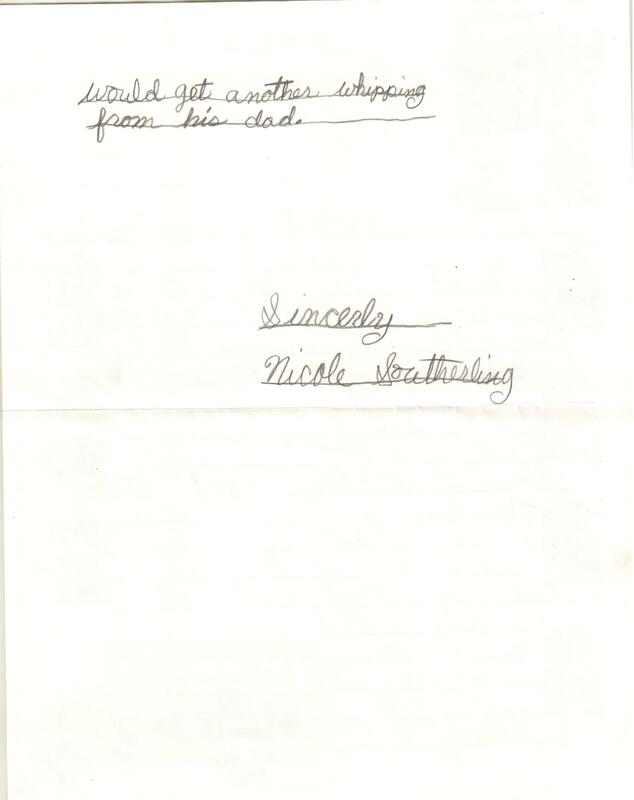 Each morning a pail of water was brought from the nearest farm by an older boy. Because of its color, the Pink School was a landmark. One story has it that insufficient red paint was donated so some white paint was added making the paint pink. Because of its unusual color and notoriety, it was decided to keep it painted pink. There were times when the quality of pink paint was very poor and soon faded to nearly white, therefore it had to be painted frequently. Miss Emeline Rowe was the first teacher beginning in June of 1854, for $10 a month, and “boarded around”. Thirty-seven pupils enrolled that first summer, six were four years old and two were 14. Male teachers were hired for winter terms when the big boys came as there was less farm work for them to do. One hundred nine teachers in all are listed. Four generations of the Rowe family and a sixth generation of the Vaughn-Waltz family have attended this school. The building was remodeled twice, to a standard school in 1926, and again in the late 1930’s as a WPA project, a kitchenette was added with storage for planks and sawhorses to set up tables for community events. Now hot lunches could be prepared. The women of the district organized in 1915 to promote school interests and for sociability. The first major project was to enlarge the playground to one acre, later landscaping and fencing were added as well as many inside improvements. 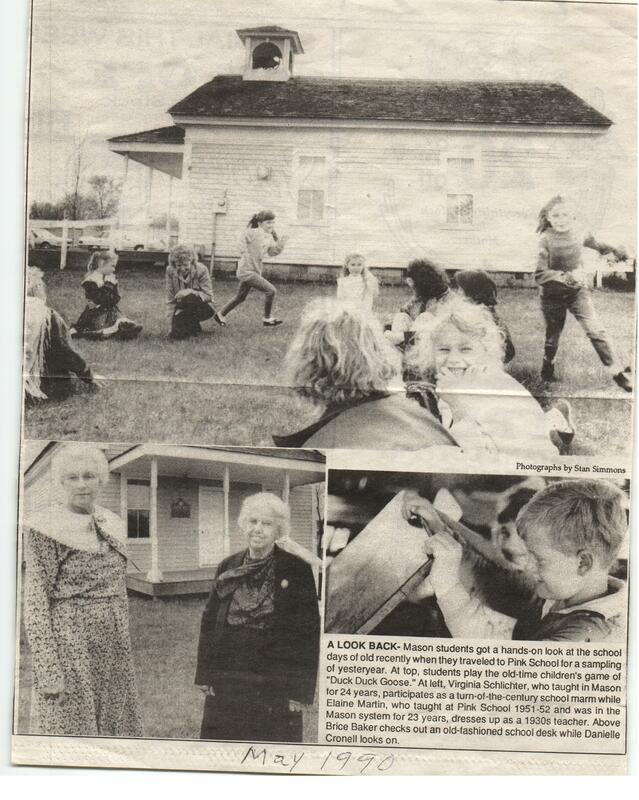 This, the Pink Community Club, met monthly in homes, at holiday times at the school for a dinner and program. On the fourth of July, picnics took place on shady lawns nearby, often at the farm now owned by Coe Emens. One hundred fifty people who attended the 1917 homecoming included nine who had attended the first school session. The centennial celebration was a memorable occasion in 1954. 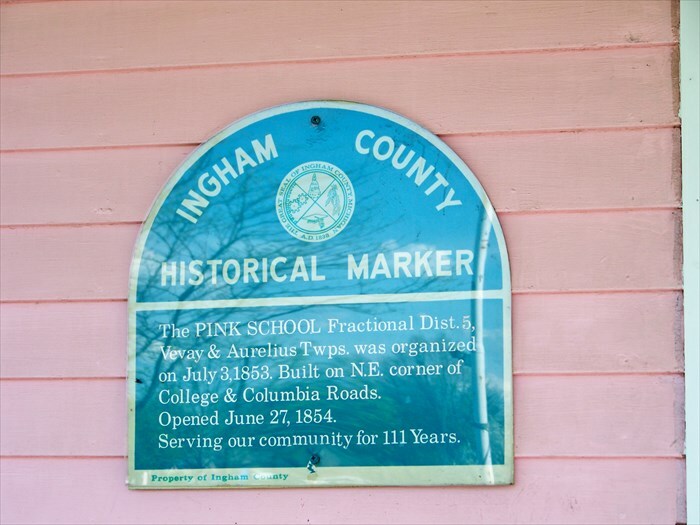 After 109 years of use, the Pink School closed in 1962 when the area was consolidated into the Mason School system. The building was then used for three more years for beginners and first graders who were bussed in, and taught by Martha (Freshour) Holmes who lived in the neighborhood. On the morning in June 1965, when Mrs. Holmes rang the bell for the last session of school at the Pink, as prearranged, Cora Bartlett stood at her porch within sight of the school. She had been directly involved for 26 consecutive years as her seven children were in attendance there. The bell rang for an extra long time. The building was sold, but never used, and stood deteriorating for several years until it was moved to West Ash St. It is now used for Mason Area Historical Society meetings and early 1900’s school experiences for visiting groups of children. 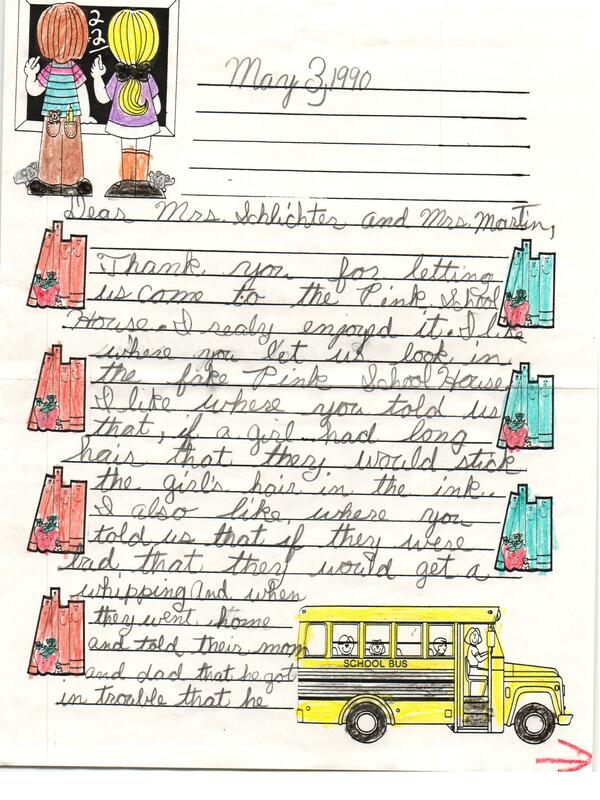 Editor’s note: E. Jean Bartlett taught in elementary education for 45 years. In 1997, at 90 years of age, she lived in Mason, near her beloved Pink School.